This is a powerful book full of godly wisdom and deserves a wide audience. 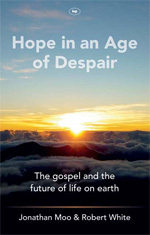 It is truly important reading for anyone seeking for hope in our troubled environmental times. While the authors describe some scenarios well known to all who are tracking the rapidly developing environmental science behind such issues as biodiversity loss, climate change, land use, food and population, the lens of hope through which they look at these severe challenges frequently gives a new perspective. It also prevents the book from adopting the Jeremiad tone that often characterises writing on these topics. Their thoughtful and biblical reflection on the problems typically leads them to fresh insights rather than to a paralysing pessimism. A blend of gratitude, realism and encouragement marks many of the discussions throughout the book. Furthermore Moo and White are right up to date, both scientifically and theologically, and so their work will stand for some time as a clear reference for anyone who wants to look carefully at these essential questions that have, for far too long, occupied the mere margins of Christian mission and concern. We owe to ourselves, to our neighbours around the world, to future generations and to the rest of life on earth to become better-informed citizens, to reconnect with our local communities and the land where we live while at the same time broadening our awareness and understanding of this entire marvellous planet which God has entrusted to our keeping.